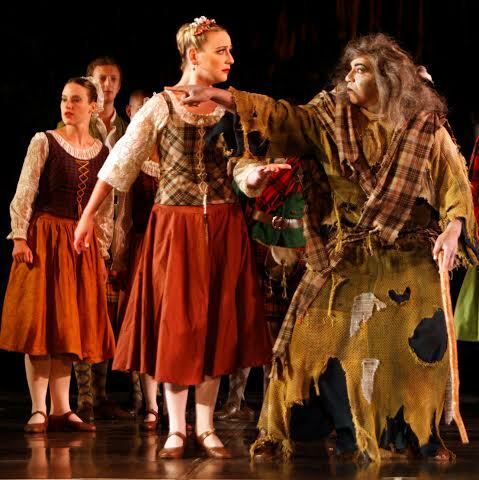 The tragic story of La Sylphide is the ideal ballet to be staged in the bewitching Maynardville Open Air Theatre, with the trees surrounding the stage perfectly evoking the Highland forests in which the story takes place. With this magnificent backdrop, very little else is needed to dress the stage: it is the dancers in their authentic tartan kilts and frocks that effectively portray the Scottish setting of La Sylphide from its first note. Choreographed by August Bournonville in 1836 to music by Herman Løvenskjold, La Sylphide was one of the first Romantic ballets created and one of the oldest surviving ballets still performed today. In the first act we are treated to solos that include the iconic Bournonville jumps and stylised arms as well as colourful, high energy group numbers into which Bournonville ingeniously infused elements of Highland dancing giving these scenes a fun folky feel. The fast and intricate footwork is performed in perfect unison by the cast, and though the spacing and lines could be sharper in the transitions between shapes, the timing and musicality is on point. Mervyn Williams as the evil witch Madge and Ivan Boonzaaier as the hapless Gurn embody their roles with charming sincerity and bring delightful moments of humour and comic relief. Laura Bosenberg is sprightly and alluring throughout as the Sylph, with her mischievous eyes and playful dancing entrancing James, played by Thomas Thorne, to leave his betrothed and follow her into the woods. The truly magical second act begins with the moon peeking out above the trees at Maynardville as troupes of sylphs flutter onto the stage through the smoke Madge has left behind. Spreading out across the stage in the romantic long white tutus for which these ballets are renowned, the patterns they form as they float about with their costumes wafting in the wind is nothing short of spellbinding. The sylphs dance beautifully together, creating picturesque tableaux and appearing truly fairy-like with their soft arm movements and light footwork. When their timing was together, the three lead sylphs – Kim Veira, Claire Spector and Rosmund Ford – were especially wonderful. La Sylphide is an iconic ballet, ably performed by the entire cast of the Cape Town City Ballet, with only one obvious fumble on opening night. On the technical side there were a few moments, especially in the second act when the sound dropped dramatically and the follow spots were a bit shaky, which broke the magical atmosphere the dancers had created. But even this was not enough to stop it from being an enchanting performance and a must-see experience at this unique venue. La Sylphide runs at Maynardville Open Air Theatre every Sunday between 1 and 22 February 2015, and at The Masque Theatre in Muizenberg 5 to 7 February 2015.